Bahria Town has always been the pioneer of state-of-the-art residential and commercial projects across Pakistan which mark as the valuable assets of the country. These projects include Golf City, Ahram-e-Misr, World’s Largest Masjids, State-of-the Art historic Monuments, well planned residential communities, and mega commercial projects across the country. 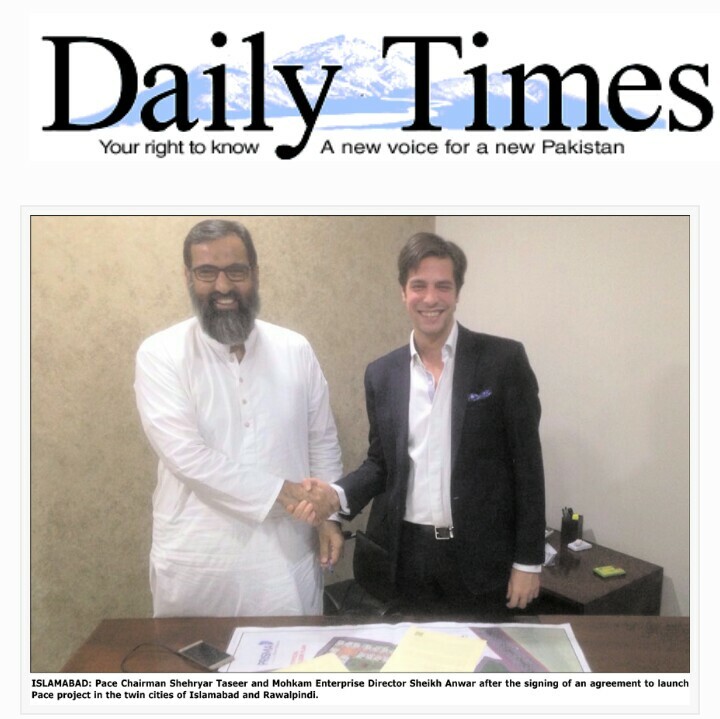 These developed commercial plots will be located on both sides of 18 lane, 400 feet wide Jinnah Avenue. You will be able to build your commercial projects on these plots right after the launch as these plots are ready for possession. Jinnah Avenue is the main expressway which leads from the entrance area up to the end of the society as per the master plan of Bahria Town Karachi while giving access to various residential and commercial blocks through internal link roads/avenues. Bahria Town Karachi Jinnah Avenue Commercial strip starts from the entrance area and ends near the International Theme Park. The intrinsic worth of these commercial plots is much higher than any other commercial project within the society, as prospective population of 1 million residents of Bahria Town will be the target customer market for the businesses set up in this main commercial area. This is the best opportunity for investors/businessmen to grab a commercial plot at this prime location and harvest manifold return in the future. Bahria Town has already launched Midway Commercial at the very central location of the society where possessions have been handed over to the owners in record time of 1 year after the launch. However, Midway can’t match the location of Jinnah Avenue Commercial. There are no authentic details regarding plot prices, payment plan, plot sizes etc available yet, however registration forms have come out for Jinnah Avenue Commercial which means these commercial plots will be allotted through balloting and a separate registration process will be conducted. Registration forms mean another game is about to begin and these forms will be the next trading commodity in the market. Actual project may take much time to launch, but investors have the opportunity to buy these forms and sell at profit. Now is the time to grab these forms as prices of these forms can shoot up right after the launch as these forms will be available through dealers so majority of people will not be able to avail this opportunity. 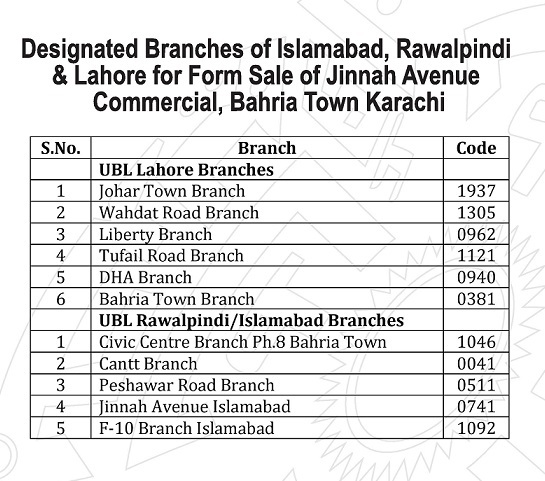 Booking of Jinnnah Avenue Commercial plots has started and last date to apply is 12th June 2015. There are limited commercial plots of 500 Sq.Yards size in Jinnah Avenue Commercial that will be given away after computerized balloting whose date will be announced after the booking is closed. You can obtain booking forms from Bahria Town Offices and submit along with Down Payment of 2.25 Crore Rupees in Favor of Bahria Town Karachi. Registration forms will also be submitted along with the booking form as only registered members are eligible to apply for booking. Total price of these 500 Sq.Yards Commercial plots is 14 Crore Rupees, out of which, 2.25 Crore Rupees has to be paid as Down Payment and remaining amount will be paid in 12 equal quarterly installments excluding the promised 20 lac discount that will be adjusted in 2nd installment. This means the project offers 3 years installment plan for the remaining amount. Registration forms are still available in the market so you still have choice to buy a registration form and then apply for booking as these commercial plots have high value from business perspective. Possessions will be handed over once you come out successful in balloting, so you don’t have to wait much in order to start your projects in this commercial area. If you do not come out successful after balloting, you will get promised 3 lac discount against your registration that will be adjusted in probably the Golf City project. Registration forms of Jinnah Avenue Commercial are being launched from 20th May 2015 and registration forms can be submitted till Monday, 25th of May 2015. Registration forms will be available on first come first served basis, so hurry up and get registered for this most lucrative commercial project in Pakistan. Registration forms can be obtained and submitted in Bahria Town Karachi site office Super Highway and designated branches of UBL bank in Islamabad, Rawalpindi and Lahore. Only registered members will be eligible to apply for booking at the time of the launch of this project. You have to submit PKR 100,000/- along with the form as registration fees. Out of this 1 lac rupees, 10 thousand will be deducted as processing fee which is non-refundable, and 90 thousand rupees will be adjusted in the installment plan or refunded in case of failure to apply for booking. After registration, you will need to submit booking forms in order to be included in balloting for Jinnah Avenue Commercial Plots. Bahria Town offers huge discount to those members who come out successful in the balloting, i.e. they will get 20 lac rupees discount including paid registration fees that will be adjusted in the payment plan of commercial plots. 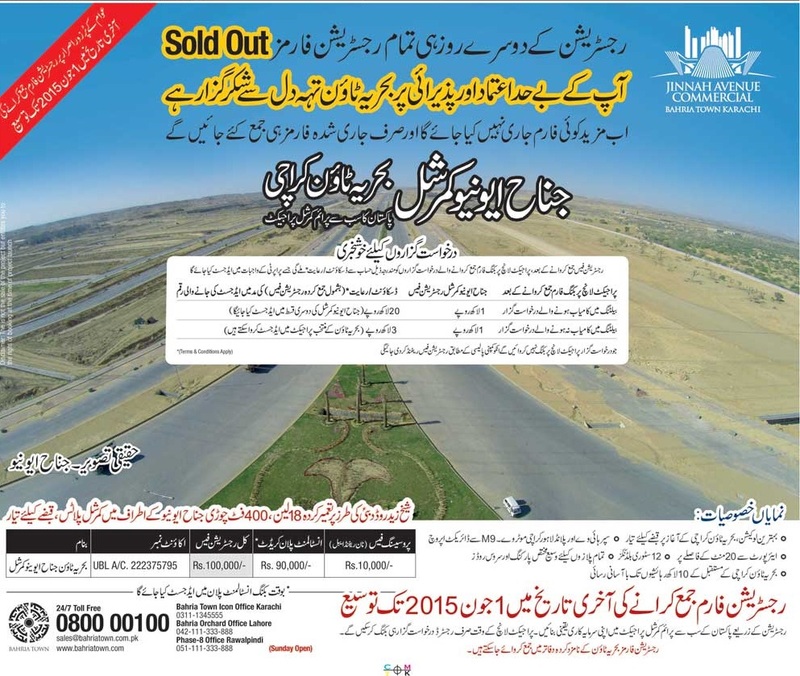 Those who do not come out successful and fail to get these commercial plots, Bahria Town offers 3 lac rupees discount including paid registration fees to them which can be adjusted in specified projects of Bahria Town. Those registered members who do not apply for booking at the time of project launch will be able to get refund of 90 thousand rupees as per the company policy. According to some sources, Bahria Town Karachi Jinnah Avenue Commercial plots will be quite large and very expensive. Possible size of these commercial plots will be 500 Sq. Yards or 1 kanal, and price will be 14 crore or 140 million rupees. Down payment amount will be 22.5 million rupees that will need to be submitted at the time of booking. There is no authentic or unauthentic news available as to the span of installment period, however we can make a little guesswork here that it can be up to 4 or 5 years considering the huge payable amount. 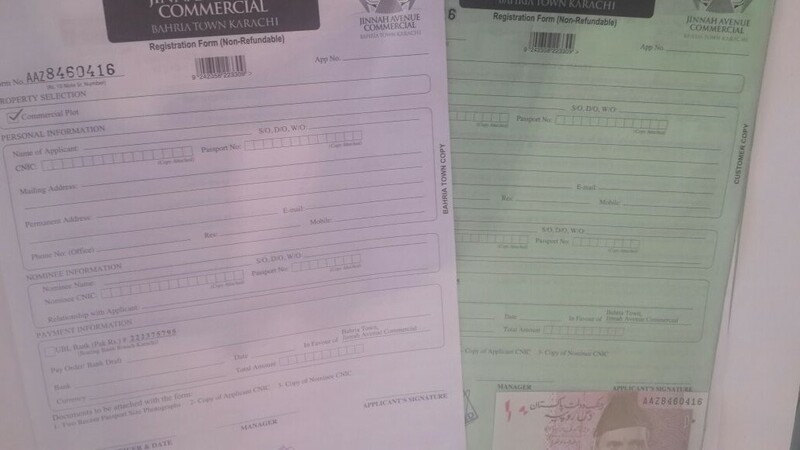 Since many dealers had started advanced booking of these registration forms of Jinnah Avenue Commercial, it will be a huge loss to those who have purchased these registration forms in advance at much higher price. Dealers had started selling these advanced bookings at more than 50 thousand per form, but today the price had plummeted to less than 15 thousand till the last news came from market. There is a possibility that same dealers who sold these registration forms in advance may start offering confirm bookings of these commercial plots, so let us see what happens tomorrow. 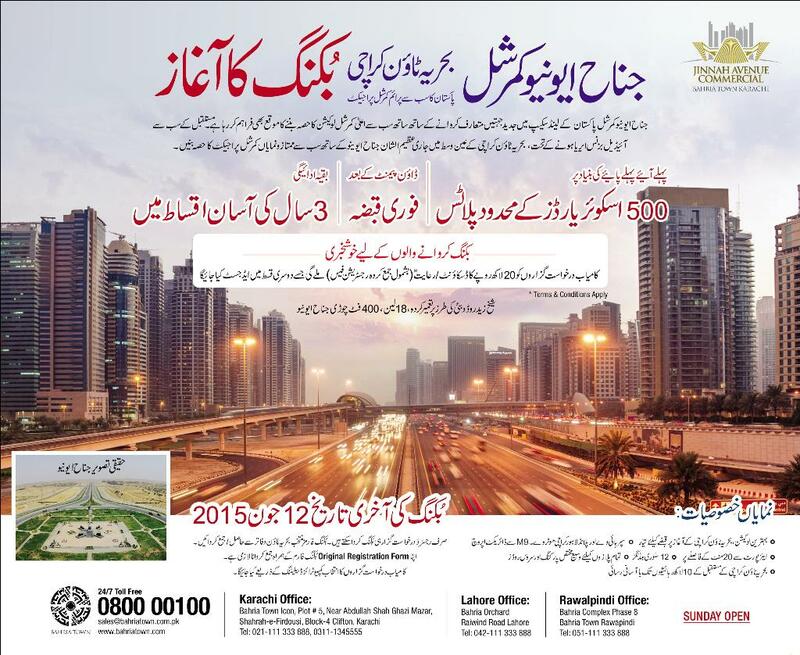 If you are looking to get registered for this project, you should visit Bahria Town’s Office in Karachi or UBL branches in Lahore, Islamabad and Rawalpindi tomorrow morning as this advertisement will be officially published by Bahria Town in all leading Newspapers. It is just impossible for Bahria Town to act fairly as it is dealers who benefit from such launches and general public have to pay extra money in order to avail such opportunities. Horde of people including dealers/investors bombarded the designated bank branches today but most of them got disappointed when banks failed to handle the mess and stopped giving away forms. Banks also make good benefit of such opportunities and most probably they will sell out forms directly in the black market at higher price. 25th is the last date for registration, so you should not wait if you are interested to get registered otherwise you will lose this opportunity. Forms are now available only in the market at some profit. Rates will keep changing so it is useless to mention any specific rate here. If you are interested to get registered, feel free to contact us as soon as possible. Bahria Town claims that all registration forms were sold out within 2 days of the launch of the project. This sounds too good to be true as we know how bahria town works. Most of the registration forms were given to specific dealers who were booking in advance at higher prices, and some quantity was given to UBL bank which made the most of this opportunity and sold these forms in black market at higher price. Major factor discouraging most investors is the expected price of this project. A large number of people dropped the idea after they came to know that they will need to pay up to 3 crore rupees as down payment at the time of booking which is quite impossible for more than 90% of aspiring people. So it was useless to become member by paying 1 lac rupees only to lose 10,000 PKR processing fees by not booking and getting back refund of 90,000 PKR. Evidently, this strategy seems to have failed as public response was less than expected, therefore form prices have plummeted badly. I hope bahria town and other entities supporting such malpractices will reconsider their strategy and try to act fairly next time they launch something. Bahria Town has extended registration form submission date of Jinnah Avenue Commercial from 25th May up to 1st June 2015. It is most probably due to least number of applications submitted so far, therefore Bahria Town is extending the date to allow few more applications. As soon as further details are available on Bahria Town Karachi Jinnah Avenue Commercial, this page will be updated with latest information. So stay tuned !